Visualizing a brain in its native space plays an essential role during neurosurgical planning because it allows the superficial cerebral veins and surrounding regions to be preserved. This paper describes the use of a visualization tool in which single gadolinium contrast-enhanced T1-weighted magnetic resonance imaging was applied in nondefective and nonresective skulls to promote visualization of important structures. A curvilinear reformatting tool was applied on the supratentorial compartment to peel the tissues to the depth of the dura mater and thereby revealing cortical and vascular spatial relationships. The major advantage of our proposed tool is that it does not require coregistration of anatomical and vascular volumes. 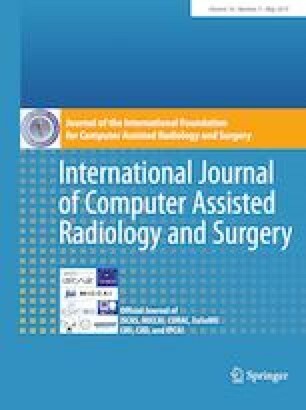 The reliability of this technique was supported by comparisons between preoperative images and digital photographs of the brain cortical surface obtained after the dura mater was removed in 20 patients who underwent surgery in the Clinics Hospital of the University of Campinas from January 2017 to April 2018. Single fat-suppressed GAD contrast-enhanced T1-weighted magnetic resonance scans provide accurate preoperative 3D views of cortical and vascular relationships similar to neurosurgeons’ intraoperative views. In developing countries with limited access to state-of-the-art health technologies, this imaging approach may improve the safety of complex neurosurgeries. The online version of this article ( https://doi.org/10.1007/s11548-018-1878-4) contains supplementary material, which is available to authorized users. We would like to acknowledge Alisson V. S. Lima for helping with the exhaustive validation tests. This study was supported by a CNPq-Brazil fellowship (305785/2012-5, 308764/2015-3), a CNPq-Brazil scholarship (165777/2014-1), a Fapesp Individual Project Grant (#2011/02351-0), a Fapesp-Brazil Grant (#2013/07559-3) to the BRAINN Research, Innovation and Dissemination Center of the University of Campinas, and a SAE-Unicamp scholarship. The volunteers enrolled in the present study signed an informed consent form approved by the Ethics Committee of the University of Campinas.